Xenogears, widely considered one of the greatest role-playing games ever made, has long felt to fans like an unfinished product thanks to its controversial, seemingly unfinished second disc. Although western gamers have assumed that the team simply ran out of money, the real story—as revealed by director Tetsuya Takahashi to Kotaku today—is a little more nuanced. Whereas the first disc of Xenogears is a sprawling role-playing game, full of towns and dungeons and beautiful cut-scenes, the second disc takes a different approach. 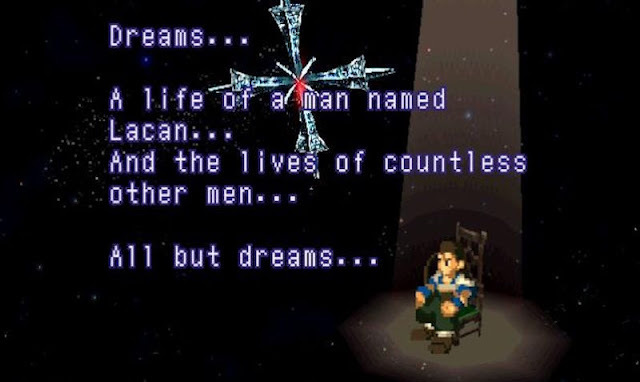 Disc 2 of Xenogears chooses to tell rather than show the game’s epic finale, putting main characters Fei and Elly in a dark room and having them narrate the game’s climactic events while a slideshow plays on a screen in front of them. It’s an unusual and jarring change of pace. Conventional wisdom has long been this: Square ran out of money and rushed the team, forcing Tetsuya Takahashi to put Xenogears’ second half together with duct tape. Fans have always believed that Takahashi had more ambitious plans but was forced to ditch them because of budget and time issues. As far as I can tell, however, there’s been no official explanation since Xenogearswas released 19 years ago. So while interviewing Takahashi during E3 in Los Angeles today about his new game, Xenoblade Chronicles 2 (more on that soon), I had to slip in a question about that urban legend. Xenogears is one of my favorite games, I said, but what happened to that second disc? So they turned disc 2 of Xenogears into the montage that shipped with today’s game. Instead of playing through events like the world’s mutation and the search for Fei, you just have to watch them. And it was Takahashi’s decision—so he could finish the story he wanted to tell rather than cutting it off after the first half.